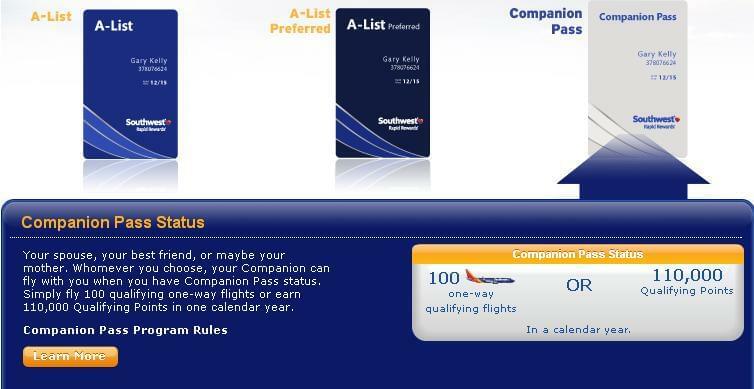 The Southwest Airlines Companion Pass is one of the greatest perks offered by an airline rewards program if you want to bring someone along when you travel. Members who earn 110,000 miles or fly 100 one-way flights per year can designate a companion who will be able to travel with them virtually free of charge, except for a security fee of around $5 each way. This can be a huge money saver for couples and families, especially since the Companion Pass is valid on award flights as well as paid ones. It’s definitely worth pursuing even if you travel just a few times per year, and it’s easier to get than it sounds. Most people see the 110,000 mile requirement and think it’s out of reach. However, the mileage requirement can be achieved via credit card sign-up bonuses and spending. For example, the Southwest Premier Rewards Visa and Business cards both frequently offer 50,000 point sign-up bonuses after $2,000 spent within three months. Getting these two cards and completing the spend takes care of 104,000 miles. You can earn the remaining 6,000 points through credit card spending, shopping portals, and dining rewards programs. If $6,000 in credit card spending sounds absurd, keep in mind that charging all your household spending can take care of a large chunk of this spend. And there are ways you can earn points on your rent and mortgage payments, which is a major expense for most of us that can help with meeting spending requirements. Since Companion Passes are good through December 31 of the following year, you’ll get the most use out of it by earning it at the beginning of the year. If you earn your Companion Pass now, you’ll only have it until December 2015 to use it giving you 15 months of use. However, if you earn it in January 2015, you’ll have it through December 2016, giving you 23 months of use. Once you’ve earned your Companion Pass, you can designate a companion by logging into your Rapid Rewards account or by calling customer service. Keep in mind that you can change your designated companion three times during the life of the pass. Once you’ve chosen your designated companion and you’re ready to redeem the pass, simply book your trip and then log into your account. Under reservations, you’ll see a link with the option to “add a companion. Simply click on that link, follow the instructions to book your companion on the flight and finalize your booking by paying the security fee. he great thing about the Companion Pass is that it doesn’t matter which fare class you booked yourself into and whether it is still as long as there are seats left you can add your companion without incurring extra charges. It’s worth noting that passengers traveling on a Companion Pass do not earn miles on their flights, which is perfectly reasonable considering they’re essentially traveling on a free ticket. Families of four can get great value out of the Companion Pass by having each adult parent pick sign up for a pass and designating a child as a companion. This is a great way to stretch both points and cash for family vacations. With Southwest expanding internationally, the value of the Companion Pass promises to be even greater in the future.